Tonight we’re rolling out a new version of Yesware that addresses recent changes to how Google handles images in Gmail to ensure that your email tracking data is as accurate as possible. It also sets the stage for some upcoming features we’ll be unveiling in the next couple of months that offer even greater insight into interest, and make it easier to connect with more people, faster. With this new release, Yesware now requires additional browser permissions to recognize you as a sender of a message (more on that below). Many of you already granted these permissions via the popup notification we sent out asking you to update Yesware this week. 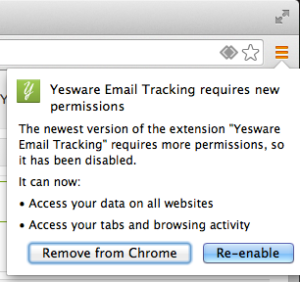 However, if you did not accept this permission before now, Yesware will no longer work or appear in Gmail. Here’s what to do if you can’t find Yesware in your inbox or run into any issues accepting these new permissions. Yesware’s gone. How do I get it back? 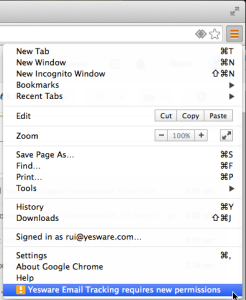 To continue using Yesware after Thursday, February 20, all you need to do is update the Chrome permission from Chrome’s menu in the top-right of Gmail. You’ll see it glowing orange due to the new permission request, similar to the examples below. Why are these permissions necessary? While this can look a bit intimidating, we want you to know that Yesware takes privacy and security very seriously. We’ve even been awarded the Skyhigh Networks CloudTrust rating of Enterprise-Ready, which means Yesware fully satisfies the most stringent requirements for data protection, identity verification, service security, business practices, and legal protection. Seeing as we only use a single extension and then open up capabilities based on your license, we need to request all permissions for all features on all our tiers for all users. In other words, we won’t access your calendar in any way unless you do use that feature, and if you DO use that feature, it will only be for that. Access your data on all websites. This permission allows us to detect when our tracking pixel is picked up by Gmail’s image proxy. This will ensure that your tracking data is as accurate as possible, reflecting only the actions of your recipients. View and manage your mail. This allows Yesware to help you compose email to send later and set reminders. We do not store any permanent copies of the bodies of you email messages. Manage your calendar. This allows Yesware to sync your calendar to Salesforce. View and manage the files and documents in your Google Drive. This allows for upcoming features that will extend Yesware functionality to Google Drive (coming soon!). Manage your contacts. This enables Yesware sync contacts to Salesforce. Manage your tasks. This enables Yesware to sync tasks with Salesforce. Questions? We’re here to help. Please feel free to get in touch with us at support(at)yesware.com if you have any questions about this process or if there’s anything else that we’d be able to help with.